Clean Energy Compression is a single-source supplier of Compressed Natural Gas (CNG) fueling systems, including compressors, dispensers, gas control and storage systems for vehicle applications and bulk CNG transportation. In 1984 Clean Energy Compression produced its first compressor. Now with over 30 years of experience, Clean Energy Compression has supplied over 1800 CNG fueling systems to over 30 countries worldwide, with a strong focus on North America, South America, China, Southeast Asia, and Africa. Clients include gas utilities, petroleum companies, fleet operators of all sizes, CNG station owners, and off-grid remote natural gas supply for industrial gas and consumer use. Clean Energy Compression is committed to building long-term relationships by focusing on customer needs, satisfaction and overall value. Effective and timely after-market support is delivered through a network of wholly owned global service centers and authorized representatives, providing technical support, parts and service. With dedication to delivering efficient, high-quality CNG solutions worldwide, Clean Energy Compression’s proven non- lubricated compressors set the benchmark for clean CNG delivery, reducing operating costs associated with oil-based compressors maintenance and oil contamination in fleet vehicles’ fuel supply. As an ISO 9001 certified company, Clean Energy Compression is committed to building quality into our products, business processes and services. In 2010 Clean Energy Compression joined the Clean Energy family of companies through acquisition. 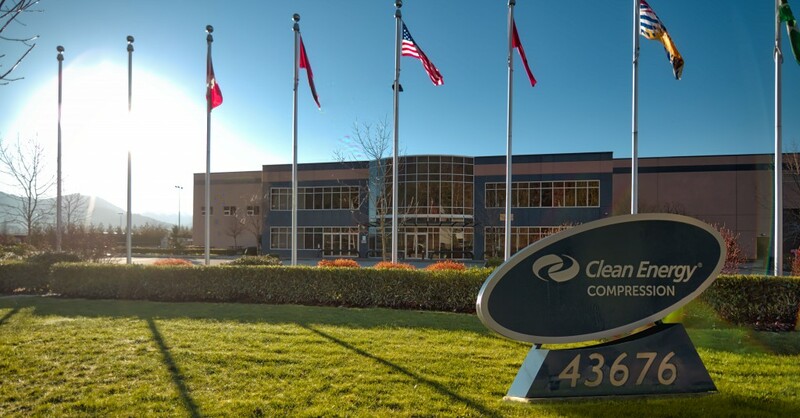 Clean Energy Fuels Corp® (NASDAQ:CLNE) is the largest provider of natural gas fuel for transportation in North America, fueling over 40,000 vehicles each day. The company owns, operates or supplies over 550 natural gas fueling stations in 42 states in the United States and in British Columbia and Ontario in Canada. Clean Energy Compression’s commitment to quality puts you first. We consistently provide our customers with quality gas compression systems, alternative energy equipment, pressure vessels, specialised industrial equipment, station construction and modification, and aftermarket support. Our products are designed and manufactured to meet the same regulatory and statutory requirements that guide your operations. Clean Energy Compression is committed to achieving customer satisfaction by consistently providing quality gas compression systems, pressure vessels, specialized industrial equipment and post-sales services. We demonstrate our commitment through ongoing product innovation and the continual review and improvement of our product quality and quality management system. This quality statement serves as the basis for setting measurable quality objectives. Each member of our organization participates in this ongoing pursuit of quality excellence. Our quality management system conforms to the internationally recognized ISO 9001 standard and applicable product standards and regulatory requirements. As an ISO 9001 certified company, Clean Energy Compression is committed to total quality management in manufacturing, construction, and daily service. Clean Energy Compression’s Canadian production plant is registered to the quality management system standards of ISO 9001 by SAI Global, North America’s leading management systems registrar. Clean Energy Compression manufactures machinery, fittings, components, and assemblies to the highest industry standards. Our Engineering and Quality Control Departments work together to ensure that material, material handling, manufacturing procedures, and test procedures comply with all applicable standards, resulting in high quality, safety, and reliability. As a global supplier, Clean Energy Compression meets the most stringent international product and regulatory requirements, including complete certification for the manufacture and assembly of pressure vessels, power boilers, and pressure fittings.